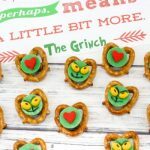 These Grinch Snacks are the perfect treat to enjoy while watching or reading “How the Grinch Stole Christmas.” They are the perfect combination of salty and sweet! The Grinch Who Stole Christmas is one of my favorite Christmas movies. Though I really love all the classics (e.g. Rudolph, Frosty, and Santa Claus is Coming to Town). 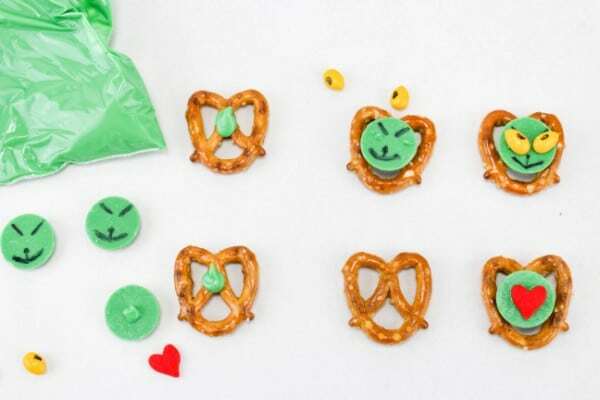 In fact, it was these Pretzel Rudolph Noses that inspired this recipe for Grinch Snacks. I absolutely love the combination of crunchy, salty pretzels with chocolate. Plus, the kids love helping to make these treats! Of course, a Rudolph nose is easy since you just need a red, round piece of candy (thank you holiday M&M’s!). 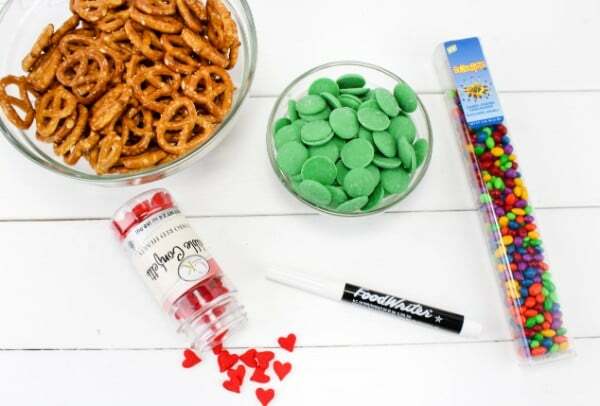 With the help of candy hearts and a black food marker though, it’s just as easy to adapt these pretzel snacks for the Grinch. 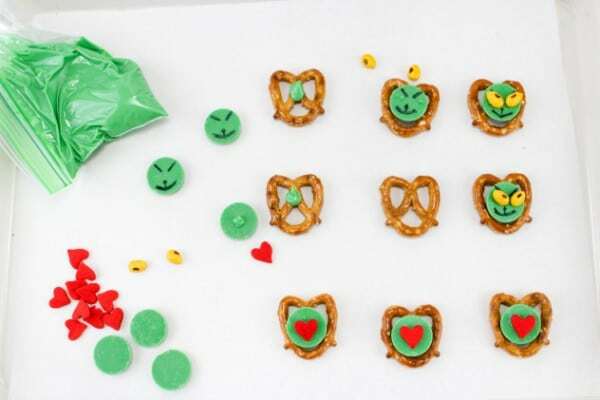 These Grinch snacks turn out really cute and they are a cinch to make. Unlike these Rolo Pretzel Turkeys, these pretzel treats don’t need to be baked at all! These Grinch snacks are easy as 1-2-3! The trickiest part is making the Grinch’s face. But trust me, if you can draw a stick figure, you can manage this artwork! The first step is the hardest since this is where we have to draw. 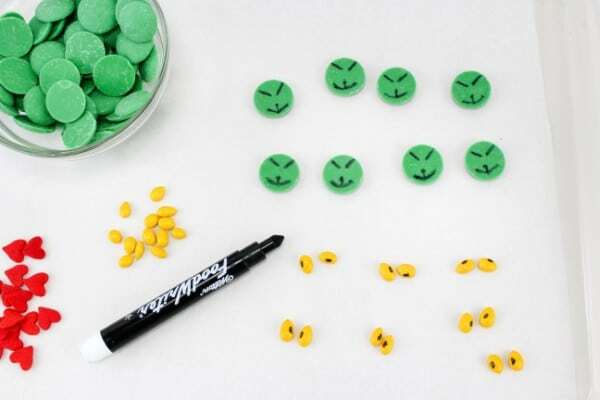 Draw a Grinch face on the green candy melts. On the yellow candy sunflower seeds make small black ovals for the eyes. Next, melt some of the candy melts and add the melted chocolate to a sandwich bag. Snip off a corner of the bag to create a piping bag. Pipe small dots of chocolate on the pretzels. 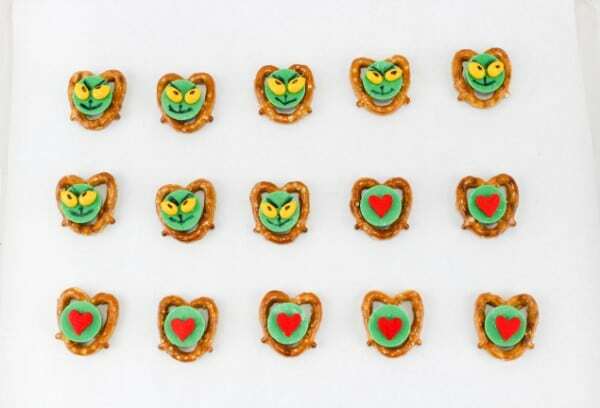 Pace Grinch faces and plain candy melts on top of the dots of frosting on the pretzels. On the Plain candy melts, place a dot of chocolate and stick on the candy hearts. On the Grinch faces, place 2 dots of chocolate and place on the eyes. Give the chocolate time to set before storing or serving. That’s it! 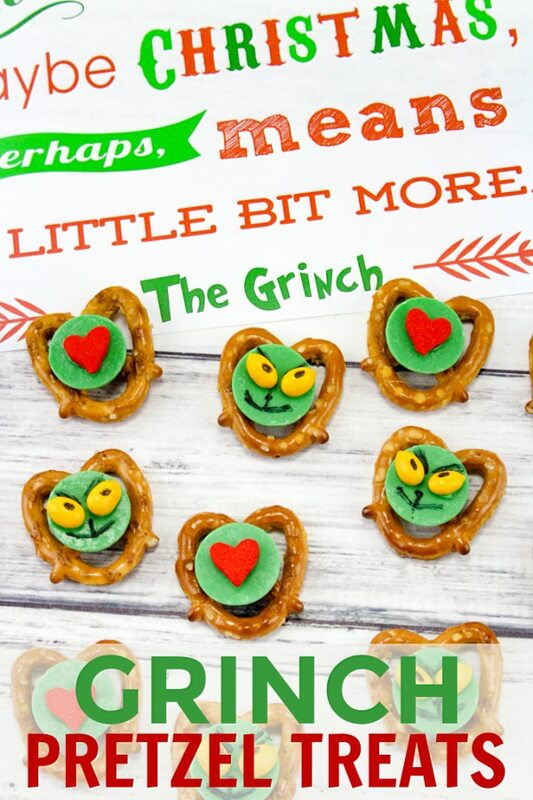 You have plenty of tasty, adorable Grinch snacks to serve and enjoy when you watch the movie or read the book! Take the green candy melts and with your food writer pen, draw on a Grinch face. Then add 2 black lines to the yellow sunflower seeds to represent the eyes. Next, melt about 1/3 cup of the candy melts and place in a sandwich baggie or piping bag. Pipe small dots of chocolate on the pretzels then place the Grinch faces and plain candy melts on top. Let Dry. On the Plain candy melts, place a dot of chocolate and stick on the candy hearts. On the Grinch faces, place 2 dots of chocolate and place on the eyes. Let dry. 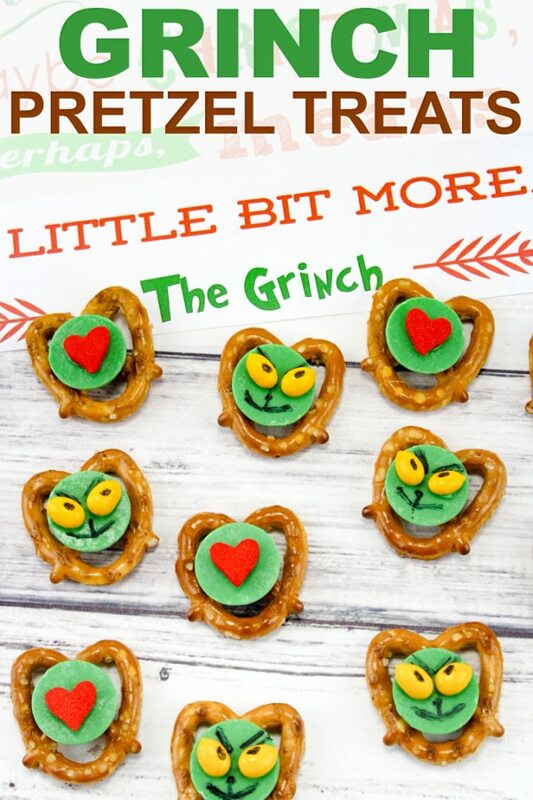 Enjoy these fun Grinch treats!! The Grinch is playing in theaters now. This is a perfect snack idea to get everyone in a festive mood while decorating the Christmas tree. Thanks for sharing.